This blog is going to be as balanced as a blog can be when it’s written by an agency. We will be honest with you about the options available, so you can make the right decision for YOUR business. 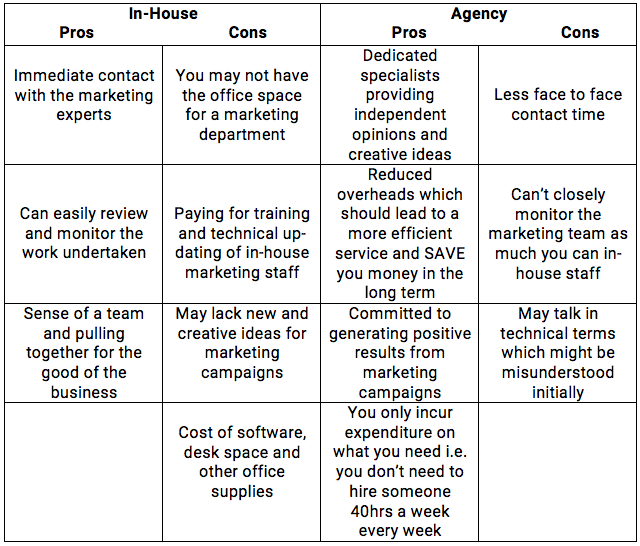 There are pros and cons to keeping your digital marketing staff in-house or outsourcing it to an agency. Let’s debunk some of the outsourcing myths and do a fair comparison of both – leaving it up to you to make your mind up which is best for your business. Although you cannot look over the shoulder of the person working for you on your marketing campaigns, you can still have the same amount of control. The key to working with an agency is communication and to ensure that the agency reports back to you at agreed intervals promptly. We like to do it monthly rather than weekly reports, so we can show our clients all the improvements we make to their marketing campaigns. 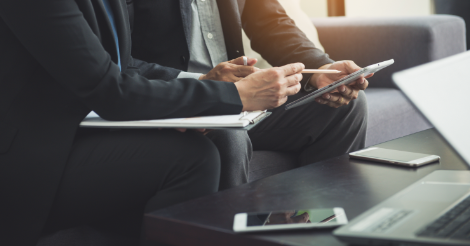 Discussing everything 3 months may be sufficient if there is a long-term strategy planned out, but our advice would be to keep an eye on whether you are getting a good ROI. 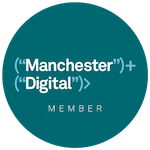 Although digital marketing isn’t free, you are not paying for a full-time member of staff. You do not have to pay for any of the extras like: insurance, health costs, pension funds and more. You only pay for what you use, i.e. you only pay for the hours that you require. 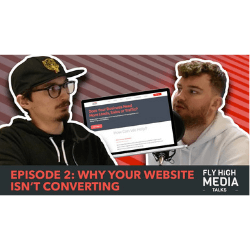 At Fly High Media, there are no complications, we offer a 30-day notice cancellation policy if you decide that outsourcing isn’t for you anymore. If had to dismiss an employee then there could be all sorts of HR considerations. Just because the agency isn’t living inside of your business day-to-day, doesn’t mean that they cannot create great content. They may not be as much of an expert as those inside your business, but that’s okay! When someone is learning all about your business from the outside, then they are emotionally distanced from your company which is good, as there will be a fresh perspective, especially on a creative project. Although social media is so widely used, its value as a marketing tool is not always understood. A lot of strategy planning goes into a good social media marketing campaign. Social media management requires a lot of time so that again adds to the hours spent on the project. We believe we are fairly priced charging between £200 – £250 per platform per month. Other companies price between £50 – £10,000 per month. Be very careful when an agency is charging £50 a month as in most things, you get what you pay for. Remember you are paying for time and expertise. Unlike other blogs, we are not going to give a verdict on what’s best for your business. 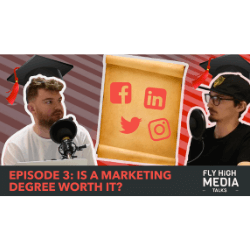 Instead, ask yourself this question – “Do I want unbiased creative, ideas and opinions on my marketing campaigns from an agency that only gets paid on the results it achieves or not? Are you interested in outsourcing your digital marketing? Book a FREE 15 Minute Digital Marketing Strategy Call and talk to us about outsourcing.